Moments after her team’s 81-76 victory over rival UConn in Friday night’s national semifinals, Notre Dame women’s basketball coach Muffet McGraw danced an Irish jig in high heels at mid-court. McGraw had reason to celebrate given the great escape the Irish pulled off to retain bragging rights in women’s college basketball’s best rivalry and keep their hopes alive of a repeat national title. Having fallen behind by nine points with less than eight minutes to go in the fourth quarter, Notre Dame roared back thanks to newfound defensive intensity and timely offensive contributions from each of its stars. Jessica Shepard gave the Irish the lead for good on a mid-range jumper with 90 seconds left, part of a game-changing 26-9 surge that secured a spot for the Irish in Sunday’s national title game. In addition to Shepard’s go-ahead shot, fellow Notre Dame starters Jackie Young, Marina Mabrey, Arike Ogunbowale and Brianna Turner each had key plays during the Irish’s season-saving fourth quarter. Young started the run with a stop-the-bleeding 3-pointer. Mabrey tied the game with one of her three 3-pointers on the night. Ogunbowale scored 11 of her game-high 23 points in the final eight minutes. And Turner delivered the game’s biggest defensive play, a final-minute block on UConn All-American Napheesa Collier that all but snuffed out the Huskies’ comeback hopes. While Notre Dame advances to face fellow No. 1 seed Baylor in a heavyweight national championship game on Sunday, UConn will watch the final game of the women’s college basketball season from home for the third consecutive season. 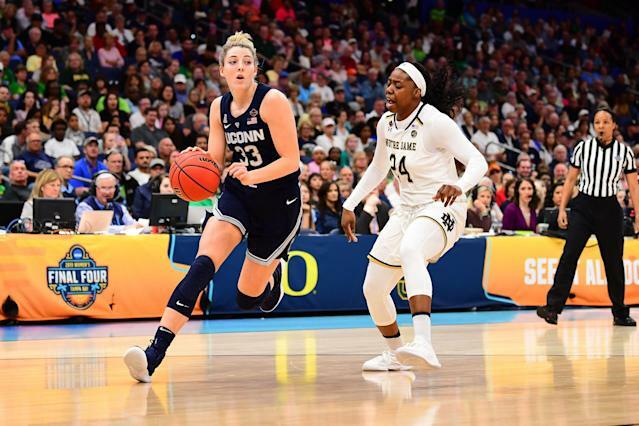 Collier and fellow senior Katie Lou Samuelson have only lost five games in their entire college careers, but three of them have been in the past three national semifinals. If UConn-Tennessee was once the best rivalry in women’s college basketball, Notre Dame has since replaced the Vols as the Huskies’ top challenger. Eight times these two teams have met in the Final Four since 2001 including seven matchups in the past nine years. While UConn holds a commanding edge in the overall series between the two programs, Notre Dame has more than held its own in the highest-stakes matchups. The Irish now hold a 5-3 edge over the Huskies in Final Four games, including Ogunbowale’s game-winning buzzer beater to beat UConn last year. UConn appeared to be in position to avenge that loss when Samuelson caught fire after a scoreless first half. Auriemma drew up a play for her out of halftime that resulted in a layup, sparking a 15-point third quarter from the senior and a 20-point second half. In the end though, Notre Dame had too much. Too many scoring threats, from Ogunbowale’s 1-on-1 skills, to Mabrey’s outside shooting, to Turner and Shepard doing damage in the post. “We knew coming in there's things Notre Dame does that we don't have an answer for,” Auriemma said.